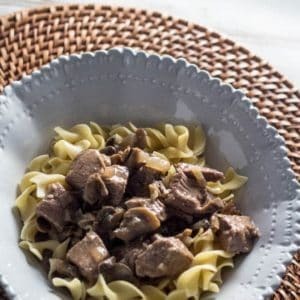 This recipe is 9 Freestyle points per serving, 1 cup of stroganoff and 1/2 cup of noodles. Spray the slow cooker insert with the olive oil spray. Add the steak, onion, mushrooms and beef broth. Add the flour, mustard, salt, pepper and sour cream. Mix everything together. Cover and cook on high for 6 hours. When the meat is finished cooking, remove the meat and cube it into small pieces. Serve on top of the egg noodles. Enjoy!